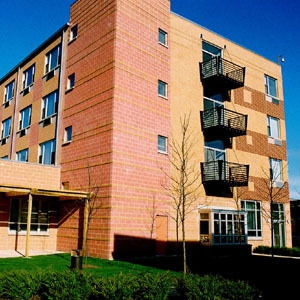 Winner of Mayor Daley's 2004 GreenWorks Award "Outstanding Residential Project"
This 69-unit, studio and family residential complex is dedicated to homeless women with special needs, including chemical dependency, and/or mental illness. Services provided by program partner, Facing Forward, enables approximately thirty percent of the units to provide a home to women ex-offenders. Some of the women residents are working toward reuniting with children in DCFS custody. IHDC took these special needs into consideration by designing large meeting spaces on the first floor. These "living rooms" offer a private, comfortable space for mothers to meet with their children / families as they strive toward reunification.